Compliments of The Hustle, this blog is a 100% lift from Zachary Crockett’s post this week. If you’re not already, we highly recommend becoming a subscriber to The Hustle. Here he’s in conversation with Professor Robert Frank economist with Cornell University. The ultra-wealthy often claim they earned their riches through hard work and perseverance alone — but luck is just as important. A toxic myth pervades the business world: Hard work and perseverance are the only things required to achieve immense success and reach the top of your field. It’s a mantra championed by everyone from Wall Street titans to our sitting US President (“I built what I built myself,” Trump told Charlie Rose in 1992. “I did it by working long hours, working hard and working smart!”). But these stories overlook a crucial ingredient of success: Luck. In his book, Success and Luck: The Myth of the Meritocracy, Cornell University economics professor Robert Frank makes a compelling case that we often dramatically underestimate the role of luck in our success. Our conversation, lightly edited for clarity and length, is transcribed below. ZC: To start us off, certain successful folks — so-called “self-made” businesspeople — believe they’ve earned everything in life due to hard work and self-determination. But you argue they’re forgetting an important factor. RF: Luck plays a far greater role in life outcomes than successful people like to admit. When you suggest that luck played a role in their success, they tend to get very defensive. I consider luck to be anything that you’re not responsible for. Something brought about by chance rather than your own actions. For success, I focus narrowly on material success [i.e. the people with the most money — those at the very top of the chain]. And are you saying that hard work and talent don’t matter? Not at all. Hard work and talent are absolutely necessary for success. The market — especially in a space like tech — is extremely competitive. So you’re probably not even going to be in the position to compete without the right mix of hard work and talent. But the point of my argument is that these things are not enough on their own. Most of the time, the hardest-working and most talented people aren’t the ones who experience the most success. There are a ton of people who are nearly as talented and nearly as hard-working as those people who probably just got a little luckier. Imagine a meritocratic contest where 98% of a job candidate’s success is based on talent and hard work and the other 2% on luck. You can run this a thousand times and the most talented or hardest-working person will very rarely win. To win, you have to be talented and hardworking — but you also have to be incredibly fortunate. You write about something called the Winner Take All market. Can you explain what this is? When you get into the top ranks of any profession, there are so many people who are so good that the difference in skill level is almost imperceptible. A Winner Take All market is a market where someone who is maybe only 1% better than another person gets a disproportionately high share of the rewards. Usually, the #1 person and #10 person in a profession aren’t that far apart. The most well-known soprano singer might only be a tiny breath better than the tenth best. But in this market, she gets a huge premium and the other one might end up being a 3rd-grade music teacher somewhere in New Jersey. Does luck begin from the minute we’re born? It begins way before we’re born. The mere fact that you were conceived is such a long-odds phenomenon: If one of a trillion things happened differently, you wouldn’t exist at all. If you’re smart, inclined to work hard, have ambition — these qualities are all some unknown mixture of genetics and environmental factors. You didn’t choose where to be born, you didn’t raise yourself, or provide the genes that made you who you are. So, when you say you’re “self-made,” it’s kind of hard to lay claim to those qualities. 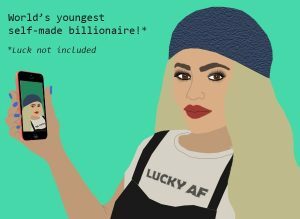 On that note, what are your thoughts on Kylie Jenner being dubbed the youngest “self-made” billionaire? [Laughs] At the very least you have to give her credit for starting a successful company. Was she lucky? Of course! She began with a lot of money and name recognition, so that title is a bit of an overblown claim. To say anyone is a “self-made billionaire” — that she earned the entirety of her wealth through merit — is nonsense. It seems like even tiny little things you’d never think about — factors out of our control — can dramatically impact your chances of success. All these little events that are out of our control might seem like they don’t matter, but they do. 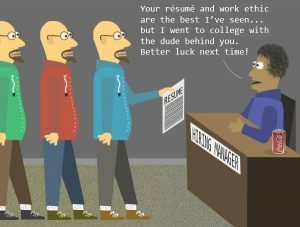 They can change your entire career path. A lot of people say things like, “You create your own luck,” or “Luck is when preparation meets opportunity.” Do you agree? Those sayings are valid, in my opinion. If you’re not prepared when an opportunity comes along, what the hell difference does it make? If you’re not prepared, you won’t be able to capitalize on an opportunity if one happens to come along. But you still have to be lucky to get that opportunity. Why do people get so defensive when you tell them luck played a role in their success? 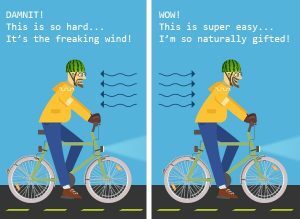 The best metaphor for this is headwind and tailwind. If you’re battling an obstacle, you’re conscious of it; you have to work hard to overcome it. But if something is pushing you along, you don’t notice it as much and you’re less likely to credit it in the narrative of your success. Can good things come out of admitting that part of your success was due to dumb luck? 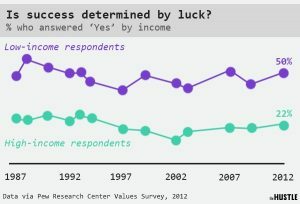 Those who acknowledge luck in success are also more generous. [One study showed that people prompted to recall instances in which luck led to a positive outcome were 25% more likely to donate money to charity than those who were asked to recall an instance where their own actions led to a positive outcome]. If people could just learn to recognize they were fortunate, they’d be happier. It’s a missed opportunity.